Heeft u een vraag voor Laras Place? Als u zoekt naar een gunstig gelegen hotel in Unawatuna, kijk dan niet verder dan het Laras Place. Slechts 1 km verwijderd van het stadscentrum, is dit een goede plek voor gasten om te genieten van de attracties en activiteiten in de stad. Dankzij de praktische locatie liggen alle belangrijke trekpleisters in de buurt van het hotel. Het Laras Place biedt tevens vele faciliteiten om uw verblijf in Unawatuna zo aangenaam mogelijk te maken. Terwijl u verblijft in deze geweldige accommodatie, geniet u van faciliteiten als wi-fi in openbare ruimtes, parkeerplaats, roomservice, vervoer van/naar luchthaven, restaurant. Het Laras Place beschikt over 2 kamers, allemaal smaakvol ingericht voor optimaal comfort, met voorzieningen als airconditioning, bureau, minibar, balkon/terras, extra lange bedden (> 2 meter). Daarnaast garanderen de talrijke recreatieve mogelijkheden dat u zich tijdens uw verblijf kunt vermaken in het hotel. Als u zoekt naar comfort en gemak in Unawatuna, dan is het Laras Place uw thuis ver weg van huis. We didnt realize that it was up a hill but it was fine in the end--it's only a 15 minute walk to town. Just a note- We had trouble with the tuktuk drivers negotiating a reasonable price to the place. The room was amazing though! Very posh! And we were pleased that it came with tea! The shower was hot, very hot and the AC worked well. The best part of it for us though was probably the breakfast. I had the Sri Lankan breakfast and it was killer. He had the western breakfast, which came with a delightful fruit platter! If you dont mind staying a little out of the way (not beachfront) then we'd definitely recommend staying here! Well worth it! Lara's place was wonderful! Its situated up a hill which gives you an incredible view to wake up to in the morning. This was by far the best value place we stayed in Sri Lanka. Everything we needed was provided. There was tea and coffee in the room along with fridge and a safe. The food was prompt and so fresh every morning. Lara (the owner) was so helpful, organising taxis, tuktuk, an iron for a shirt (no hair dryer but its way too hot for that! ), washing, extra food, advice etc, he really made the whole experience great. 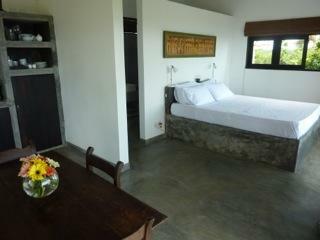 The rooms where lovely also, comfy beds, lovely sheets, very clean, hangers, awesome bathroom etc. Really really awesome place, highly recommend, would happy go back! We stayed only two nights but we would stay longer if we had the chance. The view is amazing and we enjoyed each minute. It is quite hard to get up the hill for Tuk Tuks but the managed it perfectly :-) The area is quite and a good base to relaxe. Lara offers a good breakfast and her laundry service is good as well. The is no point to criticize. This is a very high standard apartment with excellent kitchen facilities. The balconies offer a 180 view of the sea and the bay of unawatuna and the sunsets are amazing from there. The owners are downstairs, and very helpful , just what you need. Sehr weiter zu empfehlen! Abendessen bei Lara sehr empfehlenswert! Einziges mögliches Manko: keine direkte Strandlage. 10min zu Fuß, 2min TukTuk. Dafür super Ruhelage und tolle Aussicht von der großzügigen Terrasse! Abseits des Tourismusrummels in Berglage bot sich uns von unserer Terasse ein fantastischer Blick über5 den Dschungel bis zum Meer.Affen, Vögel uns Schmetterlinge wagten sich in die Nähe des Hauses. Unser Zimmer war schlicht und pur gestaltet und sehr sauber.Es war ein Erlebnis auf der geschmackvoll eingerichteten Terasse zu frühstücken.Der Besitzer und seine Familie waren ausgesprochen nett.Mein Mann bekam am ersten Abend einen Teller "fried rice" als Kostprobe. Ich habe den Aufenthalt im Laras sehr genossen. Das Frühstück vor dem eigenen Zimmer auf der Terrasse mit Aussicht auf das Meer war der Hit..
Der aufenthalt war von anfang bis ende sehr angenehm. dafür noch einmal einen schönen dank an lara und familie. Un peu loin du centre bien que au calme.. Air co extrêmement bruyant domage, petit déjeuner comme partout rien de spécial. Pas grand chose à manger sur place.